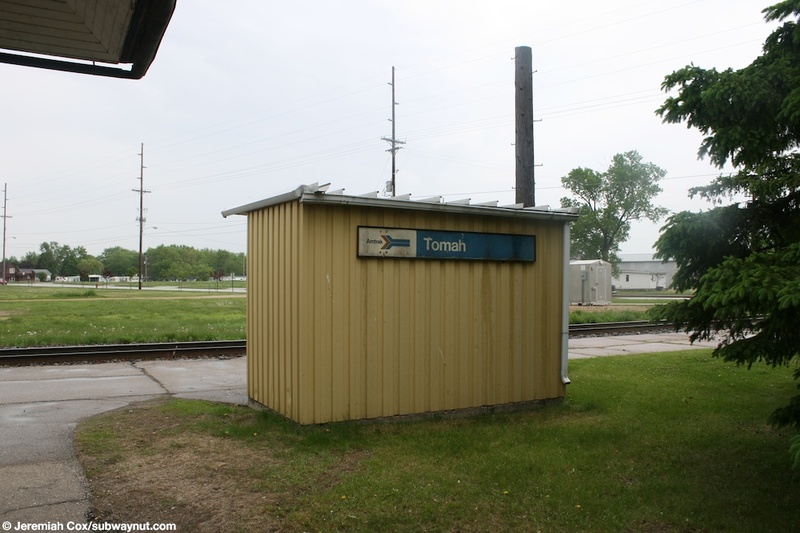 The Tomah, WI Amtrak station has a decent sized parking lot, but isn't all that close to the center of the town its in. The station has a simple sidewalk style long platform. 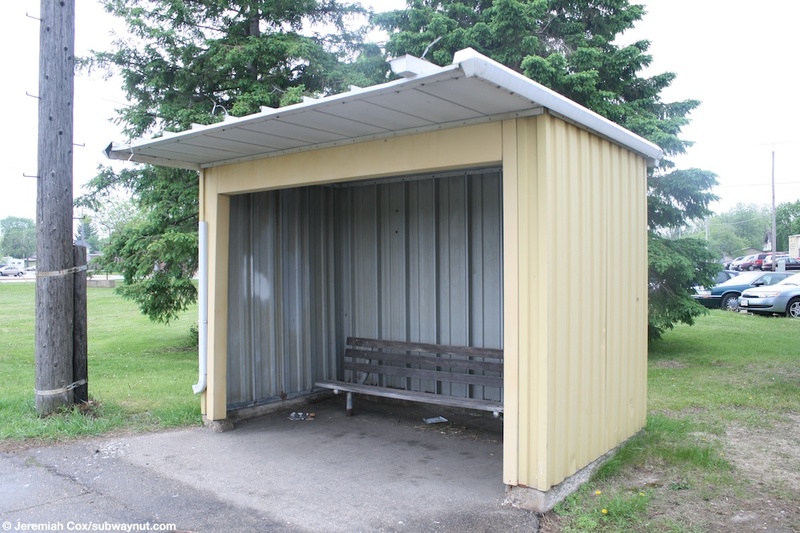 For waiting passengers there is a small modular metal shelter, opened on one side, a real Amshak with a bench in it. 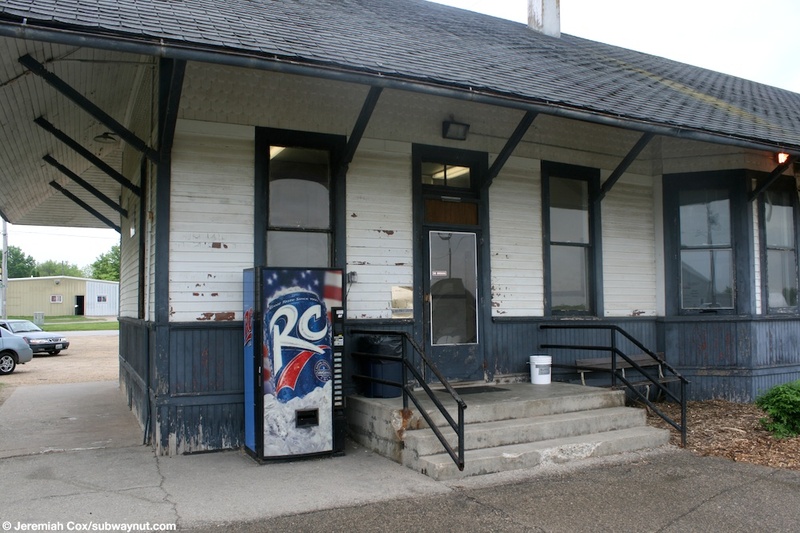 Passengers through probably would prefer to wait in the decent sized station house. 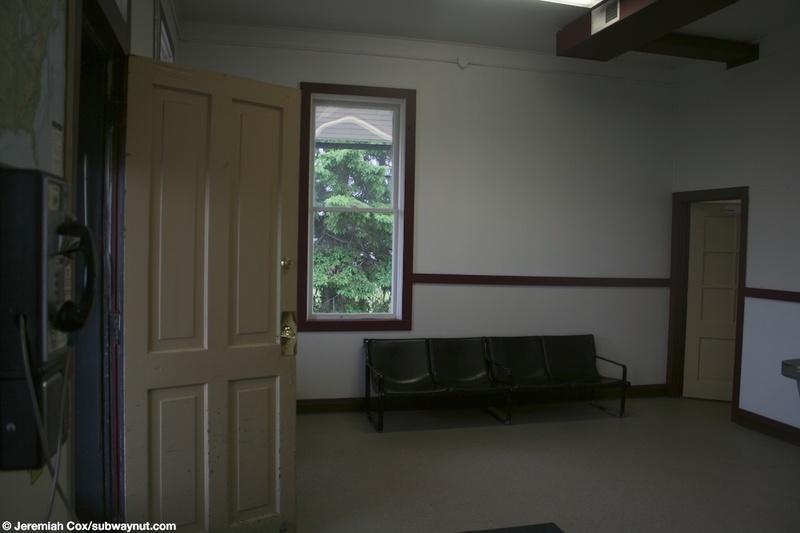 It's a fairly anaquous wooden building, that is unstaffed and taken care of by a caretaker (whose handwriting I assume is on various signs in the building, saying things like the scheduled times of the train), this building also has bathrooms, some wooden benches, and a rack of timetables. There is a map of Amtrak routes on the wall that is quite a bit out of date it shows various proposed Amtrak routes that never were actually instated. It has to be from between 1999 and 2001 (The Heartland Flyer has been created, but the Downeaster is listed as proposed). (tomah1) Approaching the landside of the Tomah Station house, I have no idea what the garage doors inside the building are used for. 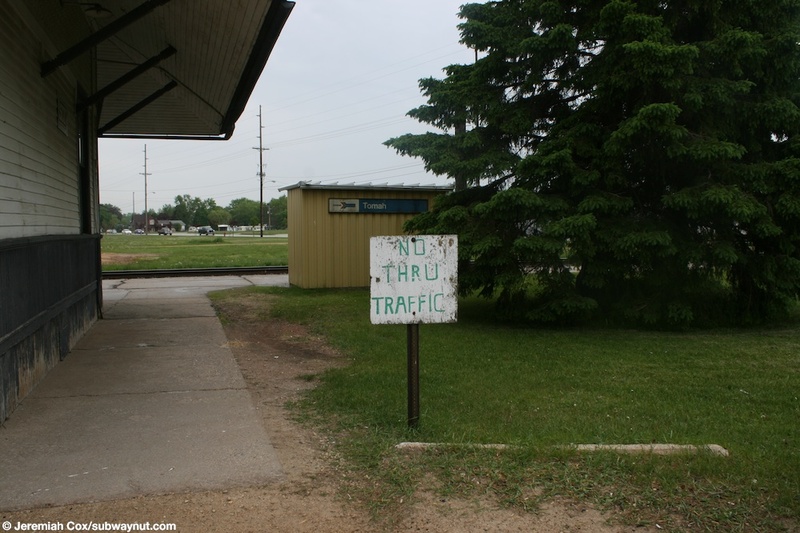 23 May, 2009 (tomah2) A sign saying No Thru traffic (I don't think cars are allowed in the first place) on the pathway that leads from the sidewalk to the platform at Tomah, WI. 23 May, 2009 (tomah3) The backside of the small metal Amshack that Tomah, WI has but doesn't need. 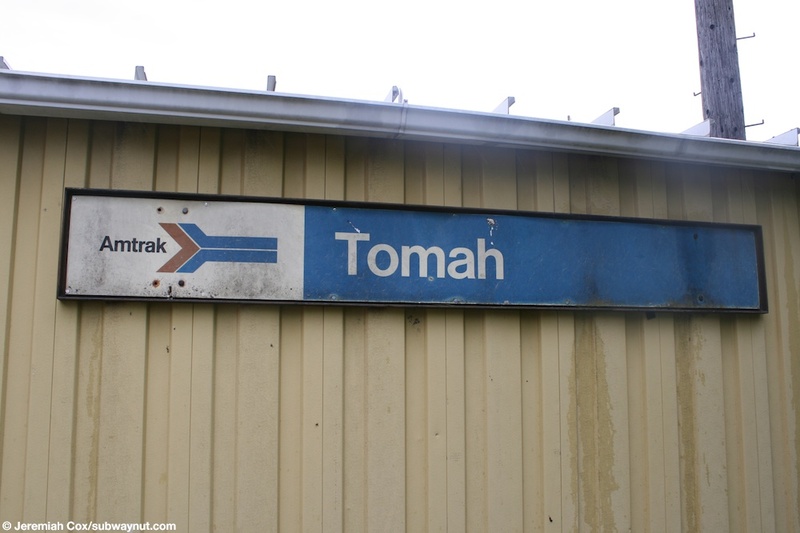 23 May, 2009 (tomah4) A pointless arrow era Tomah platform sign on the back of the Amshack shelter, unforchanately its facing the parking lot, not the platform, not being of any use to passengers on the train. 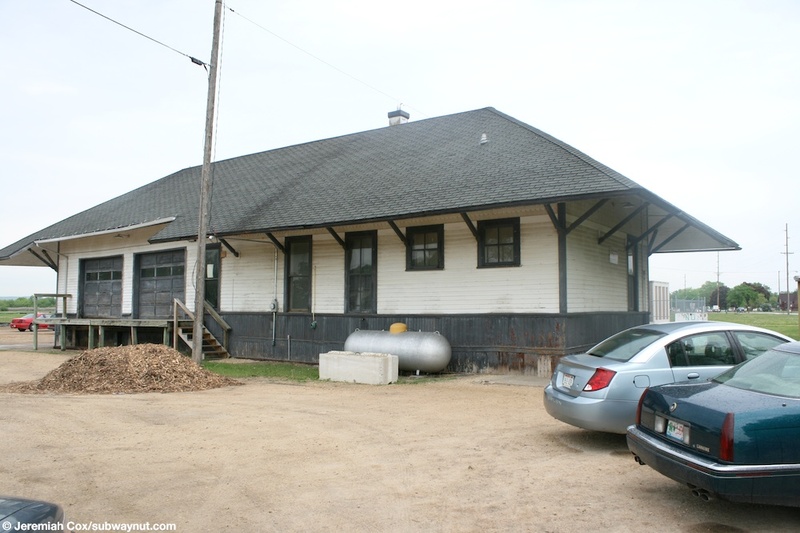 (tomah5) The staircase up to the entrance to waiting room, and the side of the station house at Tomah, WI. 23 May, 2009 (tomah6) Looking into the metal amshack waiting area, it has a bench in it. 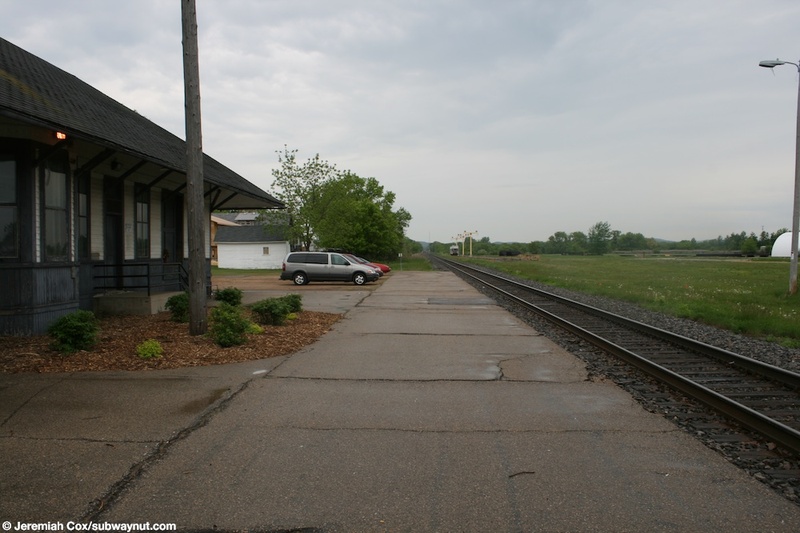 23 May, 2009 (tomah7) Looking down the platform at Tomah, WI that really isn't a platform since its completely at ground level. 23 May, 2009 (tomah8) The platform area actually infront of the station house is in a bit better shape. (tomah9) A well worn sign at Tomah, WI on the side of the station house explains how the waiting room is opened by a caretaker. 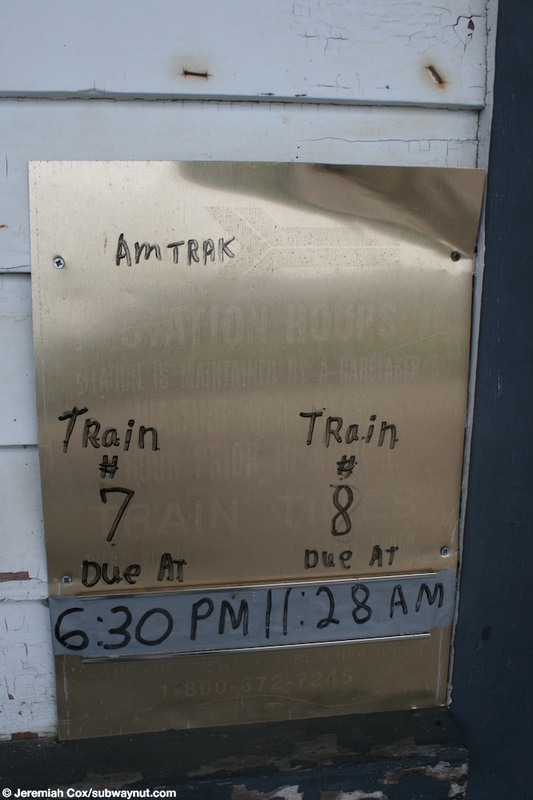 Over the almost illegable lettering the scheduled times of the Empire Builder trains have been written. 23 May, 2009 (tomah10) Some plastic chairs in the waiting room at Tomah, WI. 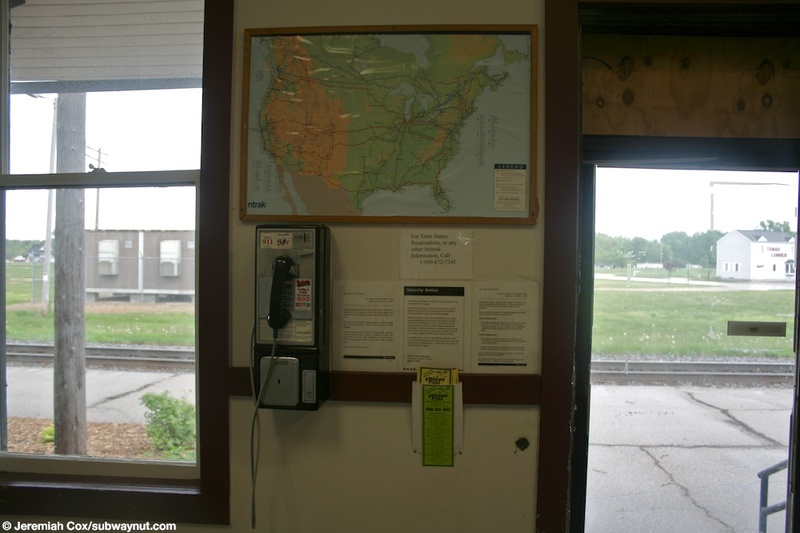 23 May, 2009 (tomah11) The Tomah, WI station pay phone and the ancient Amtrak map above it. 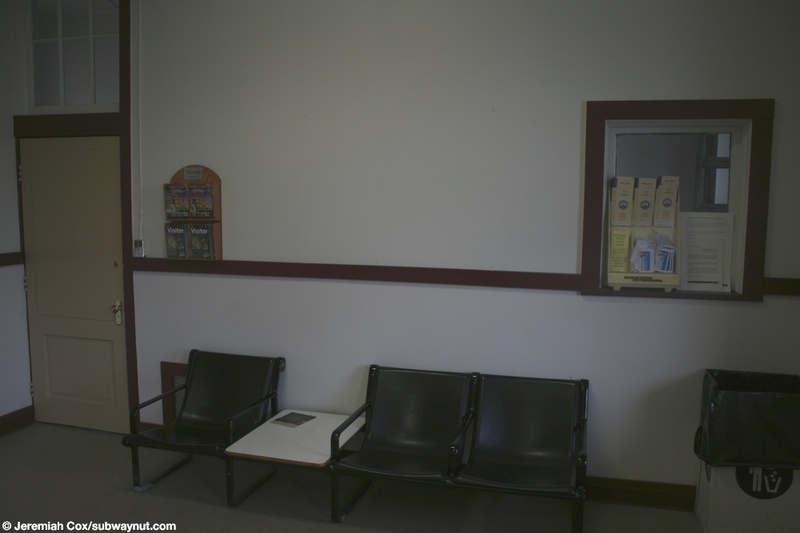 23 May, 2009 (tomah12) Another view of the large and spartan waiting room at Tomah, WI. 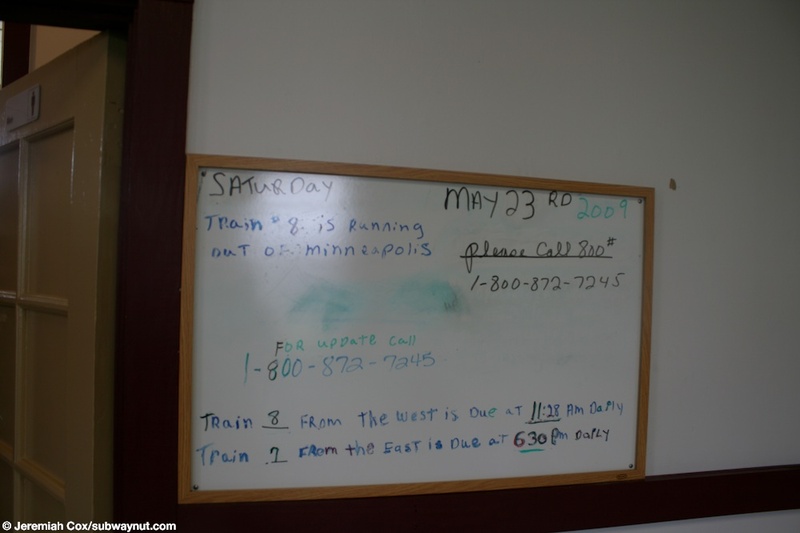 (tomah13) The caretaker has written the date on the whiteboard inside the station house at Tomah, WI, saying to call Julie for updates on the train. 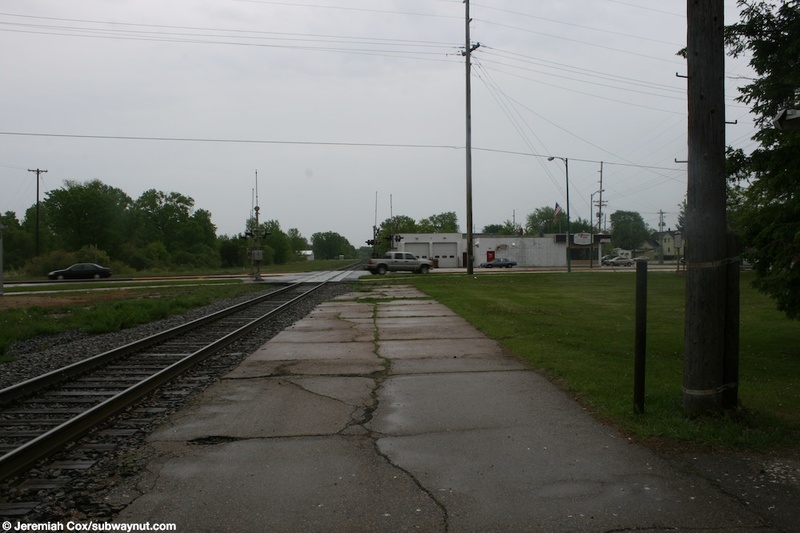 23 May, 2009 (tomah14) Looking back towards the only door of the station house at Tomah, WI.